When you need to determine your roof pitch, all you need is a bubble level and a tape measure. The level should be at least 12″ long. Step 1: Make sure your have a 12″ mark on your level. Some levels have markings already – and in this case you are ready to go (unless you have a factory label that covers the 12″ mark like we do). If you need to make the mark, simply start your measurement from one end of the level. Then put a visible mark at 12″. This mark is where you’ll place the tape measure when you’re on the roof. Step 2: Climb on the roof and measure. Climb up on your roof. Place the end of your level (the 0″ inch point of your 12″ marking) against the roof surface. Hold the level straight and level (bubble centered) and then measure the vertical distance down from the your 12” mark on the level down to the roof. 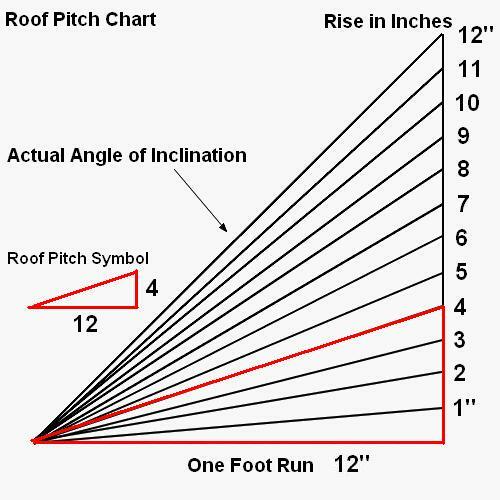 This is the amount your roof inclines in a 1-foot span or the “pitch” of your roof. Now that you have the pitch of your roof, write it down on a piece of paper because you’ll need that information to get your estimate or to order a Roofing Analysis.